(Raccoon Dogs - Wishful Thinking - 01) The raccoon dog, Nyctereutes procyonoides, has a striking resemblance to a raccoon, but is really a member of the dog family, Canidea, and is unrelated to the raccoon. 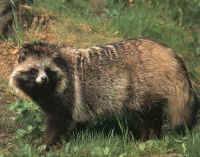 In the wild, the raccoon dog ranges in the wooded areas of western Europe, Russia, China, and Japan. They are native to south-eastern Siberia, Manchuria, northern Indo-China, China and Japan. They were introduced to western Russia, mainly for hunting purposes, and have since spread from Russia to Scandinavia, Germany, and France.